Tips, tricks and general information for most of the USA. Chayote is also known as the Vegetable Pear and the Mirliton. This vegetable is a member of the cucurbit family, which means it is a type of squash. It is probably the strangest looking squash you will find in your grocery store. The fruit is light green in color and pear shaped. The fruit is produced on vigorous growing vines that are cold sensitive. A few of the more common varieties are outlined here. We will get into more detail later. 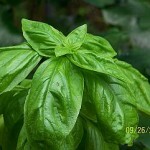 This is your basic basil, with large leaves and white flowers. The Genovese variety (names include ‘Sweet Genovese’ and ‘Genovese’ or ‘Genova Profumitissima’) is particularly nice, with a very pleasing flavor preferred for pestos. I’ve also found it a vigorous, luxuriant grower, slow to bolt. The leaves on those I’ve grown tend to be a bit larger than common sweet basil, which means you need fewer leaves for that batch of pesto! Today was a busy day. We mulched the front yard and my dad trimmed this awesome looking, blue colored bush called Plumbago. I did some research and I found out this flower is native to Southern Africa and this surprised me, seeing that it came from that part of the world. 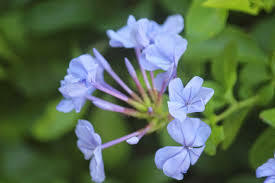 Plumbago is poisonous but that doesn’t matter unless you are awfully hungry and try to eat it. This plant looks so nice and beautiful that you can put it anywhere in the front yard and it will look beautiful. So my dad made cuttings of this plant. Trimming up this one plant made almost 140 cuttings because it was so bushy. Plumbago’s brother is called Wild Leadwort. This plant cost $110.00 at Classy Groundcovers but here at Brier Ridge Farm Fresh Herbs, we sell them in 1-gallon pots. It costs about $5 (gallon size) when we have our yard sales. So, which would you prefer, a $110 plant from someone you don’t know or $5 for a gallon-size plant grown locally here in beautiful Punta Gorda, Southwest Florida. 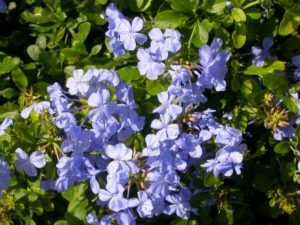 Plumbago grows outdoors and blooms almost year round in Zones 8-11, although some protection may be necessary in Zone 8. If you live in a colder climate, Plumbago is happy to grow inside as a houseplant during the cold months. Just move it outside after danger of frost for lots of new growth and lovely blue flowers. Yes, You CAN grow it! I’m always on the lookout for new gardening ideas. And so, I’m a member of Home Depot’s Garden Club. Yeah, that’s a “big box” store and we normally steer clear of them, but let’s face it: they come up with good ideas and sometimes there’s just no other place around to get garden supplies or an emergency plant. Today, when I opened my email, I received one from the Garden Club that contained an interesting indoor decorating video. As I followed that link, I found this video about hydroponic gardening. It just doesn’t get much easier than gardening hydroponically. You set up a kit that looks pretty simple to build yourself, plant your herbs or whatever in soiless pots and feed with a liquid nutrient. That’s it. You quickly have pots of herbs right inside your house, garage, or basement because there’s no mess to worry about. I haven’t actually tried this yet but it looks pretty simple. If you get to it before I do, please share your experience and let us know how it goes for you. That’s not a misprint. I really mean GoGo instead of BoGo, which we all know means Buy One, Get One. So what is GoGo and GoGo Gardening? It means Grow One, Get One. It’s not my original thought, though. I borrowed it from an article in the latest copy of “Florida Gardener”, my absolute favorite gardening magazine… next to new seed catalogs in January, of course. I just received the Oct/Nov issue in the mail yesterday. The article is full of interesting little gardening gems, all of which give you at least two distinct “crops” from the same plant. Grow one plant and get the bonus crop, too. That’s GoGo Gardening. Did you know that the pretty fern-like foliage that grows at the top of a carrot is edible? I sure didn’t. I’ve always cut it off with about an inch of good carrot attached. That makes a wonderful treat for the rabbits… or the goats. However, I think they’ve lost at least a part of their treats. I’m planning to use some myself. Carrots are closely related to parsley… and that’s exactly what those leaves taste like! I’ve never had much luck growing parsley but carrots are another matter. The article didn’t say anything about drying and saving the carrot leaves as you would parsley so I guess I’ll try it when I have the next carrot crop. Sweet potato leaves are also edible. Supposedly, they taste like a milder, more tender substitute for spinach. If you like home-grown spinach, you know it only grows during cool weather. That’s in extremely short supply in SW Florida… but sweet potatoes love our hot, humid summers. So… you plant sweet potatoes in the spring, munch on the leaves all summer, either raw in a salad or cooked as a green, and then dig up the sweet taters in the fall. That’s a lot of mileage out of a single crop! Everyone knows by now that pumpkin seeds, when dried and toasted, are a tasty, nutritous snack. But did you know that the tender vine tips and newly opened baby leaves of the calabaza tropical pumpkin are also edible? The calabaza tropical pumpkin grows exceptionally well during our summer months when very little else will. A single plant (50 ft vine!) took over the entire garden the year I tried it. However, that’s another story. By now I think you’re getting the picture on this GoGo Gardening concept. Don’t go around munching on anything and everything in the garden, though. Some of the stems, vines, leaves or roots can be toxic. Things like tomatoes…. only the fruit is edible, so far as I know. Rhubarb leaves are definitely off limits. You can only eat the stems and then only after they are cooked. Yesterday, my neice and I visited an herb farm. She’s into making herbal things like soap, body rubs, lotions and all that stuff and was having a hard time finding what she wanted. I just like to grow things… and I’ve been looking more and more at herbs. I’m learning to use them in cooking at this late stage in my life and of course, I simply love the smell when you walk through the garden and brush against some of them. We found (and purchased) prostrate rosemary. I have a nice “regular” rosemary plant but it grows upright. I saw the trailing variety at the Flower and Garden Festival at Epcot recently and just fell in love with it. And we found (and again, purchased) a perennial basil. “African Blue Basil” was written on the tag. I need to do some research into that one to see just how hardy it really is. There was a very nice variety of herbs available, many I’d never even heard of before. I got everything potted into larger clay pots yesterday evening and put them in a semi-shaded area so they could adjust to their new home. They came from a very shady place, one with lots of big oak trees in addition to the shade house itself. Here, they just have the shadehouse. Most herbs like sun but I don’t think they need it all at once. I put a fennel plant in the back part of the half-barrel planter out by the end of the driveway. It should produce a nice tall and lacey background for the lower growing plants that are already there. I saw a lot of containers at Epcot that used fennel as the tall accent in a grouping. Let’s see if it will work for me. Today I have to find a home for a second fennel and two un-named lavender plants. I wouldn’t have bought those if the lady hadn’t shown me some mature plants near her house. On the table in the shadehouse, these little things were downright puny and very insignificant. The mature plants, however, were simply lovely. I promise to get some pictures posted later today or maybe tomorrow. You know how it goes around here. Even the simplest of chores sometimes takes an entire day or longer! “Frost” on the Pumpkin, indeed! Well, that bit of frost in early December turned into a hard freeze with the temperature dropping to 24 at one point. I was totally unprepared for THAT, so needless to say, we lost a lot of plants. Not the pumpkins, though. My prized, very old Desert Rose plants both appeared totally dead. I could only hope some roots deep in the pots might send up new shoots, if and when spring arrived. I’m beginning to wonder if maybe the Earth has tilted on its axis and we are living in Zone 4 these days! The big, very old white plumeria was ruined. Once again, hope was all I had. The clump of bananas was totally black. I figured the trees were beyond hope, from the looks of them. Naturally, the starfruit tree suffered. That poor thing has died back to the roots every winter since we planted it. The worst part was that it finally had a single small fruit this time. Sigh! And all the moringa trees were dead. All the ruined plants really depressed me. On top of that, a family situation developed that really changed life on our little farm. Oh, well. Life goes on whether you feel depressed or not. And around here, Winter disappeared as suddenly as it had arrived. We got a totally surprising rainfall and the weather has stayed somewhat warmer than normal ever since. By February, it was firmly into Spring and of course that meant “garden time”. This year I decided to go back to container gardening, using the many Earthboxes I have, rather than struggling with raised beds and all the multitude of soil-born problems. First of all, I tore up the raised beds and raked the soil in them over the low spots in the garden area. I kept the beds that run along the fence but I’m using them a bit differently. Instead of using them to grow vegetables, I’ve planted one section with three Barbados cherries and a citrus tree. The other section has blackberries planted. Since the fruiting plants are still quite small, I’ve planted some veggies in between them. Then, I rolled out the heavy black stuff that I normally use as flooring in the shadehouse. It’s that woven plastic stuff you see in most plant nurseries. Keeps out the weeds and grass and provides a clean walkway. Then I lined up the Earthboxes and started filling them with fresh soil. I’ve used Earthboxes for a number of years in my container garden, but as with anything else, I only followed the directions for the first year or two. Then I began modifying little things here and there… and eventually my Earthbox garden became a weedy, tangled mess that didn’t produce much at all. That’s why I tried the raised beds when we moved here. This year, I’m going back to the basics and following the instructions to the letter. I have pictures of the various stages of my Earthbox container garden. Stay tuned as I get them uploaded. Trust me… you will be totally amazed at my garden this year! I have a moringa tree growing in my back yard, mainly because the story I heard when I visited Echo a few years ago fascinated me. At the time, my oldest son was in dire condition with Crohn’s Disease and the tale they told sounded so much like a miracle that I just had to try it. If this tree could save the starving babies in Africa, why couldn’t it save my son, who was wasting away before my eyes? Besides, I’m a great one for edible landscaping and the thought of being able to eat just about any part of this tree thrilled me. Also known as the Drumstick or Horseradish Tree, Moringa Oleifera is one of the world’s most useful plants. It’s cultivated in many 3rd world countries for its leaves, fruits, flowers and roots for a variety of medicinal and nutritional purposes. Its seeds are used for water purification, its roots can be grated and used as a horseradish substitute, its flowers are delicious dipped in batter and fried… and the immature seed pods make a tasty bean-like vegetable . Every bit of the moringa has a use. However, the leaves are most precious. According to the Trees for Life organization, gram for gram, Moringa leaves “contain 7 times the vitamin C in oranges plus 4 times the calcium in milk plus 4 times the vitamin A in carrots plus 2 times the protein in the milk plus 3 times the potassium in bananas.” Moringa leaves “could practically wipe out malnutrition on our planet.” Moringa is a sub-tropical tree. A mature tree can tolerate only very mild frosts; any frost at all will kill a young tree. Highly drought resistant, once established, although leaf production is severely reduced during times of drought. Can be difficult to transplant if the roots are disturbed. Grows up to 35 feet in height under favorable conditions. Zone 10. My first moringa tree was grown in an Earth Box and it was doing quite well. I was adding the leaves to my salads and enjoying them until the time I decided to have a salad made with only moringa, no lettuce. Okay. There was a slight off-taste that I can’t quite describe but it wasn’t one that I liked. From then on, even the tiniest bit of moringa in my salad brought out that flavor. I gave the tree to my parents. Then, when my son had lost so much weight due to his Crohn’s disease, I decided to try talking him into trying the leaves. Moringa has been shown to save African infants dying of starvation and malnutrition, when they are so far gone that they can’t even keep food down when it’s given to them. Why not try this with my son, to see if his damaged digestive system could handle the leaves or even tea made from them? So, I bought another small tree and planted it in an Earth Box, too. At the time, my back yard flooded with every hard summer rain, sometimes staying flooded for a week or more before the water drained away. I didn’t want to take a chance on planting it in the ground and losing it. This tree was much prettier than the first one and the leaves totally lacked that off-taste I had grown to hate earlier. I was munching on the leaves as I worked outside, as well as adding them to my salads. My son was essentially laughing at me and my ideas, even as he wasted away before my eyes. Then came Hurricane Charley. The entire top was broken off my moringa tree, leaving me with a 4 foot, naked pole with a shattered top. I sawed off the jagged edge, down to where I could get a smooth cut, and then waited, hoping for the best. The tree was never happy after that. It put out a new branch but it seemed as though the leaves died as fast as they formed. In the meantime, since we lost so many big shade trees, I gave my son 3 little moringa sprouts, each just a few inches tall. These things grow FAST so I figured they might provide some shade faster than other trees. He didn’t have to eat them… but they would be available. Well, he neglected those poor little things pitifully, for months. Eventually he got around to building a series of raised beds for a garden. He planted one little moringa tree (about a foot tall now) into the center of each bed. His reasoning was that they would provide some light shade for his garden, to help block the hot summer sun, and the falling leaves would provide food for the garden as a natural mulch. He called me about a week later and asked if I could come to his house to look at the trees. He was practically in shock that they had grown nearly 6 inches in a week. So I went to look at them and it was truly amazing. You could almost see them grow now that they had room to spread their roots. I plucked a leaf and munched on it, just to see if he had the good tasting varieties. He looked at me as though I was weird but he humored me when I suggested he taste just one leaf. He had the good-tasting variety. Not long after that, he had another severe attack with his illness and out of desperation, he tried my suggestion and ate some leaves, all the while swearing he wouldn’t be able to keep them down. Amazingly, he not only kept them down but within a few days’ of eating the leaves regularly, he felt better. My son kept on eating a handful of moringa leaves every day and one day appeared on my doorstep, offering to help me with the brick patio I had decided to build. He had some color in his face and certainly more energy than I’d seen in a very long time. Suffice it to say that he is still eating moringa every day… and has increased his “forest” to nearly a dozen trees. Leaf production drops drastically in the dry months so his answer was to plant more trees. He has gained a substantial amount of weight and is now back to work full time. He hasn’t had an attack of Crohn’s for over a year now. us in worrying about gaining too much weight. Is the moringa truly a “miracle tree”? We believe it is. And an awful lot of formerly starving people in Africa and other third world countries agree with us. One of our favorites for dependable holiday bloom indoors is the amaryllis. You can usually find the bulbs on your garden center’s shelves or in catalogs beginning in mid-September through February. And nothing could be easier to grow than amyrillis. The amaryllis, being a sun lover, will grow best in a sunny window that gets at least 6 hours of good light every day. They like warm temperatures, around 70-75 F, which means they will be happy in the average home. Once flowering begins, moving your amaryllis to a slightly cooler location, about 65 F, will help to make the flowers last longer. Your amaryllis bulb is a big ugly thing that somewhat resembles an onion. If your bulb is loose, rather than preplanted in a pot or container, the first thing you’ll want to do is locate a pot or container that’s about an inch or two larger in diameter than the base of the bulb. Clay or plastic will work but make sure it has a hole in the bottom for drainage. Plant the amaryllis so that one-third to one-half of the bulb is above the soil or growing medium. This ensures that the bulb’s nose stays dry which helps prevent fungal infections. Use any good potting soil to grow your amaryllis. Water immediately once you plant your amaryllis bulb. Keep the soil slightly moist, but not overly wet. When flowering starts, increase the frequency of watering. Water when the soil surface feels dry, usually once a week. Do not fertilize the plant while it has no leaves. This is important to remember since the bulb generally will send up the flowering stalk before it does much in the way of leaf development. Fertilizing too soon will kill the roots… and that means no flowers. Once leaves begin to develop, fertilize twice a month using a soluble fertilizer recommended for indoor potted plants. Remove the blossoms as soon as they fade to prevent seed formation, which would simply weaken the bulb. Do this by cutting the stem off just above the bulb. Do not remove any leaves. Make sure you keep your amaryllis in a sunny window now and water and fertilize it regularly. This is the active growth stage of your bulb and proper care now will give you a bigger bulb (and more flowers) next season. It’s easy to bring your amaryllis bulb into flower again next season. First of all, decide when you want it to bloom. Then count backwards about eight to ten weeks. That’s when you will stop watering and fertilizing the bulb. Yes, it will seem to die but don’t worry, it’s simply taking a rest. The leaves will turn yellow and wither but don’t be alarmed. At this point, when the leaves are dead, if your bulb seems to have grown so that it’s pressing against the sides of its pot, you can replant it into something larger. You will notice the first signs of new growth beginning after an eight to ten week dormant period. When you see the top of the new flower bud beginning to emerge from the bulb, carefully trim off all the dead or yellowed leaves and repot it, if it seems too crowded. Then move the pot to a sunny area and start watering it again. Remember, no fertilizer until it has leaves! Rotate the plant every few days so the flower stalk doesn’t lean towards the light too much. You will be rewarded with flowers very near the date you planned. And that’s all there is to bringing your lovely amaryllis bulb into bloom for a second season! ‘Tis the season and our thoughts are turning to gifts and decorations once again. And once again, my favorite in BOTH categories comes to mind… the lovely Amaryllis! Want some bright, cheerful color inside for the holidays? Plant amaryllis! This big ugly bulb will burst into bloom in just a few weeks with very little effort on your part. Because it’s so spectacular in appearance and so easy to grow, the amaryllis makes a wonderful gift, too. Amaryllis can be found in just about any garden center at this time of the year. Most popular is the deep red color but these days, there is a wide variety of colors, textures, shapes and sizes in amaryllis blossoms. Anything ranging from snow white to pink or peach or even stripes and picotee has been added to the various red varieties. Choose a pot that is only slightly larger than the diameter of the bulb. Amaryllis likes to be somewhat crowded. Be sure you have about a half to one inch of space all around the bulb and it will be perfect. Fill the pot about halfway with good potting soil and then set the bulb on the soil surface. Fill the pot so that about half of the bulb is left exposed. Water thoroughly and then put the pot in a warm, well-lit spot and forget it for a while. Don’t water it again until you see growth. From that point on, keep the soil evenly moist. You will most likely see a flower bud growing long before the leaves show up. That’s normal, so don’t be alarmed. This thick sturdy stem will have just one large bud at its tip, but when that bud opens, you should have a cluster of 2 to 4 huge flowers. Bigger bulbs will have more flowers. If you plan to save your bulb for a repeat performance next year, feed it with a houseplant fertilizer according to the package directions. And when the flowers fade, cut off the stem to conserve the bulb’s strength. Do not cut the leaves. Those are essential to the bulb’s growth for next year. When the strap-like amaryllis leaves begin to yellow and die, withhold water from the bulb until the soil dries out. Then remove your bulb, shake off any loose soil and store it in a cool dry place. Next year, about 6 weeks before you want to see blossoms, plant your amaryllis bulb exactly the same way you did it this year. You’ll need a larger pot, though, because your bulb should have expanded from its original size. You can repeat this process year after year for as long as you care to do it. Each year, your amaryllis bulb will grow a bit more, rewarding you with more and larger blooms each season.